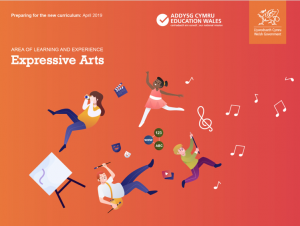 We heard some brilliant presentations and met lots of fantastic teachers and creatives at the four-day celebration of creative learning through the arts organised by Welsh Government in partnership with Arts Council Wales. There was far too much going on for us to report back in detail, so we’re sharing some brief notes and a tweet collection from the morning on day 3. Diane Hebb, Director Engagement and Participation, Arts Council Wales, kickstarted the morning with an inspiring presentation about the possibilities and potential of the new curriculum for the arts sector. Carys Pugh D’Auria, Head of Area of Learning and Experience for the Expressive Arts, Welsh Government then explained how teachers and artists have been co-creating the Expressive Arts AOLE, resulting in the draft curriculum which will be out for consultation on 30th April, and showed the films below. • healthy, confident individuals, ready to lead fulfilling lives as valued members of society. You can view the Expressive Arts ‘What Matters’ statements in the presentation further on. Finally there was lots of lively debate at the table discussions and open feedback session before Diane Hebb closed the morning.